This is another cake using mango . 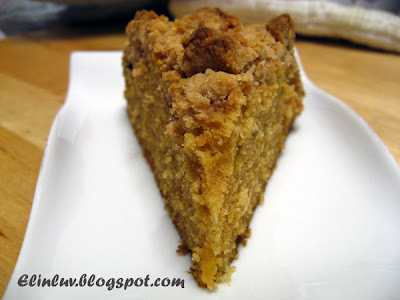 This Mango Streusel Cake recipe has been in my to do list a year ago and I am very attracted to the crumbly streusel topping. Well put it this way…every cake has its own texture and taste. Love the crumbly top and the mango in this cake. 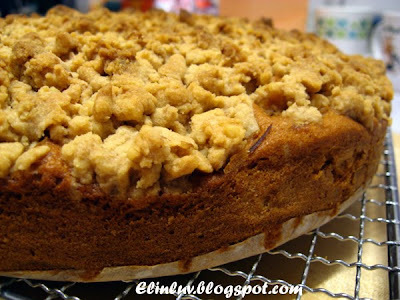 It is special flavor and it is moist...good cake to take to a party. To make the Streusel Topping, combine all the ingredients above with hand until it forms a crumbly mixture. Make sure you rub the butter evenly into the mixture for even texture. Heat the oven to 350° F. Lightly grease a 9”X9” cake pan with butter and dust with all-purpose flour. Sift the flour, baking powder, baking soda and salt into a large mixing bowl. Beat the butter and sugar in a separate bowl until light and fluffy. Beat in the eggs , one at a time, until it is incorporated into the butter mixture. Now slowly fold in the flour mixture to the butter mixture . Add in the vanilla essence and mango puree until it is well blended into the batter. Pour the batter into the prepared pan; top with the streusel topping evenly over the surface. Bake for 35-40 mins at 350° F or until the edges have separated from the sides of the pan and a wooden toothpick inserted in the center comes out clean. Remove from the oven and let the cake cool on the wire rack for at least 15-20 mins. To enjoy as a dessert,cut into wedges, top with vanilla ice cream, and garnish with more mango slices. Note: just like any other fruit-based cakes, this Mango Cake tastes better after 12-24 hours as the flavor of mango seeps in. So try baking it ahead to save time and get more flavor! Mouthwatering cake . Pass me a piece dear. 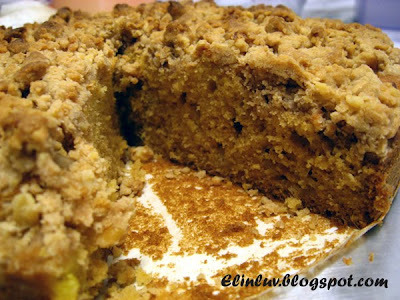 Streusel cake....my favourite! And with so much mango in the cake, it must be extremely delicious.